G. Walter Hansen comments on the religious life of Galatia and the importance of Zeus and Hermes to the people who lived there. This evidence, says Hansen, provides the setting for the events of Paul and Barnabas at Lystra. Luke describes the reaction of the Lystrans when they saw Paul heal a lame man. Bruce reminds us that “Zeus was the chief god in the Greek pantheon; Hermes, the son of Zeus by Maia, was the herald of the gods” (The Book of the Acts, NICNT, 292). 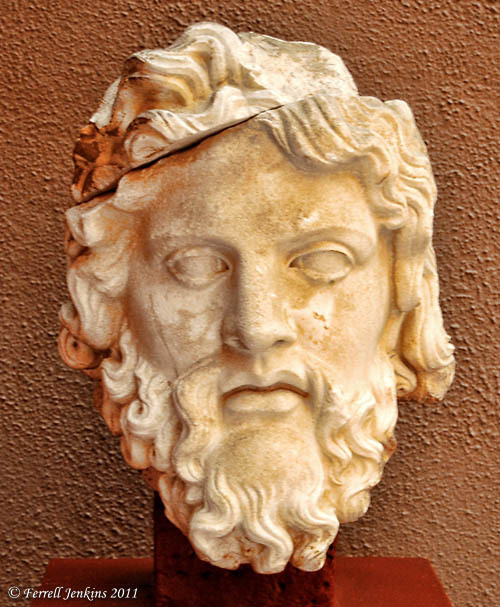 Our photo of Zeus is of a bust displayed in the archaeological museum at Ephesus. Bust of Zeus in the Ephesus Museum. Photo by Ferrell Jenkins. Paul was called Hermes because he was the chief speaker. Hermes was the messenger of the gods. How appropriate that our word hermeneutics, coming from the name Hermes, is used to describe the important work of interpreting the Scriptures. I have heard some speakers make fun of the word and then proceed to say that a certain phrase in the Scripture means … ! The photo below shows Hermes tying on his sandal in preparation for delivering a message. Some may recognize Hermes as the Latin Mercury, who is used as the symbol for the floral industry. Hermes Putting on Sandal. Displayed in the Louvre. Photo by Ferrell Jenkins. This entry was posted in Archaeology, Bible Places, Bible Study, Culture, New Testament, Photography, Travel, Turkey and tagged Apostle Paul, Greek gods. Bookmark the permalink. Regina, Thanks for your kind comments. I am pleased that you find the material I write helpful. One of my study books, O Tema da Bíblia. Um Estudo sobre o Plano da Redenção, is available for free download in PDF at http://bibleworld.com/Tema_Biblia_Jenkins.pdf. I thought you might find it interesting. Best wishes, Ferrell.